While looking for international and cross-themes that can help all the players of the Centenary in building new bridges of knowledge, a simple and terrible fact emerges: the War of 14-18 was also the first cruel intrusion of trauma in the lives of millions of children. All wars eventually turned into such an intrusion, but with this conflict we assist to a violent impact of the reality of war in family life, economy and psychology and probably for the first time we're allowed to speak about a childhood experience of the mass war. 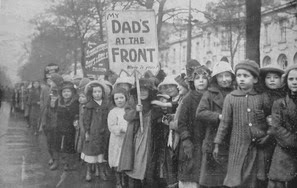 Many efforts were undertaken to deploy huge masses of little boys and girls for war purposes. One of the worldwide experts in this field is Manon Pignot, professor at University of Picardie and author of many studies about the "children of great war". Among her books we now recall Paris dans la grande guerre, L'enfant-soldat: XIXe-XXIe siècle, Allons enfants de la patrie : Génération Grande Guerre and La guerre des crayons : Quand les petits Parisiens dessinaient la Grande Guerre. Notwithstanding the multiple attempts to approach such delicate theme that deals both with a great amount of sources and with the difficult of interpretation, we are still far from giving a clear portrait of the European children of the time. At any rate, this portrait remains an important goal for historians since we have to keep in mind that the war trauma and experience occurring to boys and girls are shaping the imagery of the Second World War generations. So, beside the important and immediate research, there is a kind of long-term return in terms of knowledge and implications. The Italian venue of "Institut français" in Milan is going to host a conference with Manon Pignot next 21st of October. Here is the website of the organization.